I took part in an exhibition of illustration in January 2017, a show called Pinups which ran at the Fumbally Exchange in Dublin and in Kilkenny Arts Centre. The show was a homage to the songs of David Bowie. 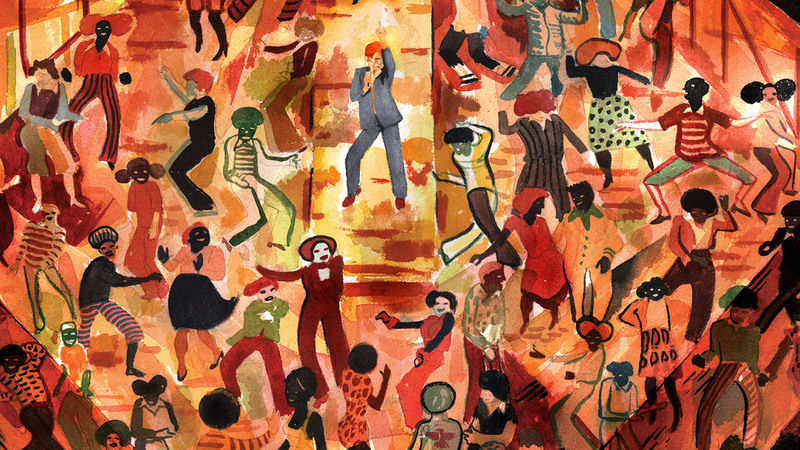 Each illustrator was given two of Bowie’s songs and was to create an image of each, conveying something of the spirit or content of the song. I got Life On Mars and Young Americans. The song covers a lot of ground, but is a fragmentary reflection of Bowie’s mixed feelings of horror and admiration for America. 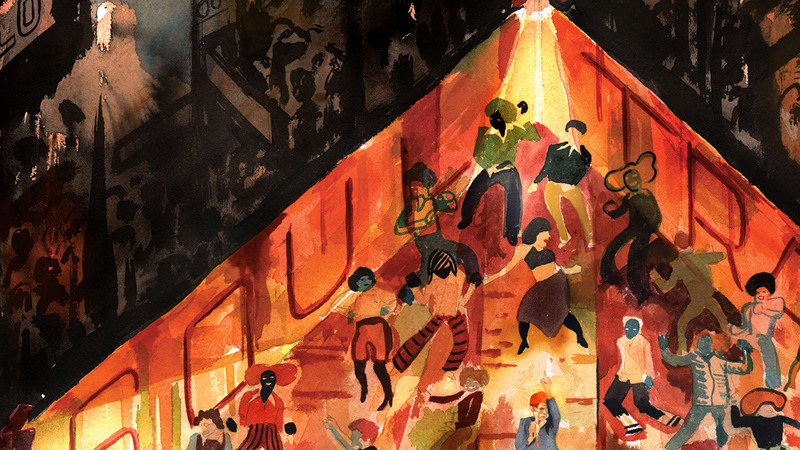 He played on the TV show Soul Train around this time, so I decided to depict a tight knot of dancers in the Soul Train studio (with Bowie performing) while all around, outside in the darkness, a more shady and perhaps less joyful reality exists. Media: watercolour and Indian ink on watercolour paper. I took part in an exhibition of illustration in January 2017, a show called ‘Pinups’, which ran at the Fumbally Exchange in Dublin and in Kilkenny Arts Centre. The show was an homage to the songs of David Bowie. Each illustrator was given two of Bowie’s songs and was to create an image of each, conveying something of the spirit or content of the song. I got ‘Life on Mars’ and ‘Young Americans’. The song covers a lot of ground, but it is a fragmentary reflection of Bowie’s mixed feelings of horror and admiration for America. 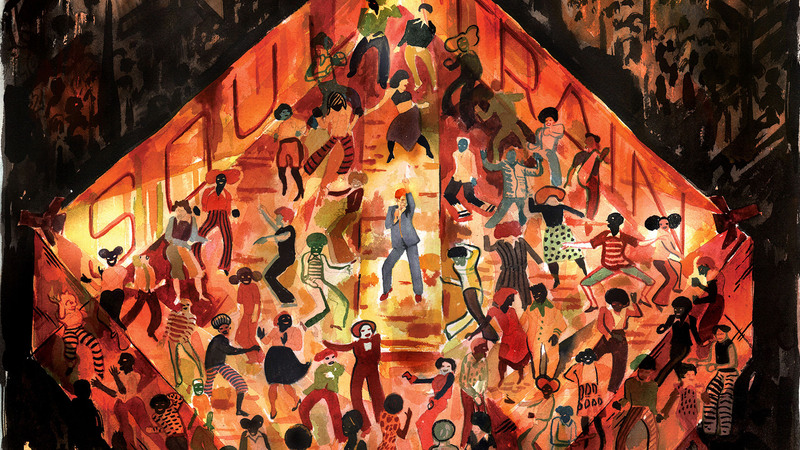 He played on the TV show Soul Train around this time, so I decided to depict a tight knot of dancers in the Soul Train studio (with Bowie performing), while all around, outside in the darkness, a shadier and perhaps less joyful reality exists. Media: watercolour and Indian ink on watercolour paper.